Following these shaving guide will help you achieve optimum skin health, avoid shaving problems and help you look and feel your best. Proper wet shaving techniques, quality products, and post-shaving skin care can help you look and feel your best and help avoid razor burn, razor bumps, and irritation. A good, close shave followed by the right facial wash and after-shave moisturizer products go hand in hand to achieve optimum skin health. And, it can turn a chore into a pleasant morning ritual. This guide has been adapted from our professional barber handbook - that teach barbers the proper wet shaving service. One of the keys to a great close shave without irritation or razor burn is to make sure your beard is thoroughly wet. Facial hair will absorb moisture up to 30% of its volume. Hair swollen with water becomes quite weak and therefore easier to cut. Showering before shaving is the ideal way to ensure you beard is properly moistened. If a shower is not possible, rinse your face and then apply a warm moistened towel to your face for at least a couple of minutes. This is the technique that barbers use. Never shave cold or apply shaving products to a dry face - this is one of the leading causes of razor burn and shaving rash. Use a shaving cream that has a high concentration of lubricants and moisturizers. The best shaving creams create a rich creamy lather and do not foam up like the cheaper drugstore brands. The less "foaming" in the shave cream the better, as it is what is in contact with the skin and beard that matters - all else is wasted. Less resistance, less irritation, and fewer nicks also mean a longer lasting blade! While the primary function of the shaving cream is to lubricate your face so that the razor will glide smoothly and effortlessly across the surface, it also serves to lock the moisture into the whiskers, keeping them soft and upright, primed for the cut. The ideal scenario is to leave the shaving cream on your face for at least a minute before you begin cutting so that the beard is as soft and wet as possible. Always use a good quality sharp razor blade. Be sure the blade is sharp. You're not just cutting off hair, you're also scraping off up to two layers of surface skin when you shave. A dull blade is more traumatic to the skin, making your face feel scratchy and look blotchy - a dull razor is one of the contributing factors to razor burn and shaving rash. Depending on the toughness of your beard, change the blade somewhere between every three and every ten shaves, if you shave every day. Two weeks is too long to go without changing blades. 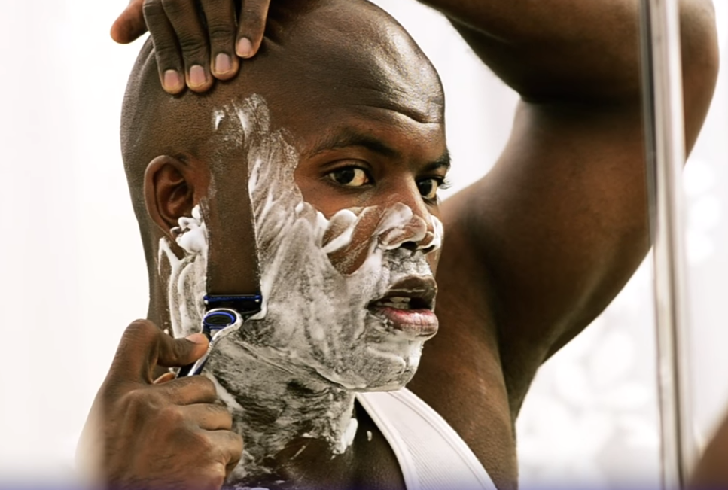 Regardless of the number of shaves, if the blade becomes dull, ditch it. As to which brand of the razor to use - we think you can't go wrong with any of the Gillette Mach series. Of course, there are very high quality and expensive razors available at specialty retailers that you may want to try. Rinse your blade under hot water before you begin to shave and after every few swipes. This removes the accumulated shaving cream, whiskers, and skin gunk. The use of hot water here is to help lubricate, has nothing to do with "killing bacteria." Ideally, shave in the direction of the beard growth. Start with the sides, then the mustache area and last the chin. The chin hairs are the toughest, so this allows them the most time to soften under the shave cream. Shaving against the direction of hair growth gives a closer shave, but you run a high risk of cutting off a hair below skin level, causing an ingrown hair (razor bumps) - the whisker grows into the surrounding tissue instead of out of the pore, resulting in inflammation and possible infection. To avoid these shaving problems, again, shave "with the grain" (that is, in the direction your hair grows). Each person's facial hair has its own growth pattern. If you are unsure of the direction of your beard, let it grow for a day or two and you'll see it. You also need to let the razor do the work - do not press too hard or it will cause razor bumps (ingrown hair) and razor burn. By the way, you do NOT need special razor bump products - 99% of the razor bump problem will be solved by not pressing too hard, shaving with the grain and using a good shaving cream. If you wish to achieve an even closer shave (as many barbers do) apply some more lather from your brush (add more cream if necessary) to the areas, you wish to shave again. Keep everything moist. This is one of the extra advantages of using a brush. For most guys, re-shaving certain areas with the grain should do the job. Professional barbers, by the way, usually first shave with the grain, and then re-shave going sideways - but they're trained professionals! But, don't over-shave. Too much shaving will cause skin irritation and the dreaded razor burn and shaving rash. Rinse the blade thoroughly before you put it away. (The water temperature isn't going to have any impact on bacteria; you're rinsing the blade to get rid of hairs, shaving cream, oils, and gunk, not to kill bacteria. You'd need to boil the razor for that or rinse it in alcohol, which is not necessary.) After rinsing, shake the razor, but do not wipe the blade with a towel or tissue - that will just make it dull faster. Shaving can remove up to two layers of skin. There is no other regular activity that does this, which is why it is so important to use a good quality moisturizer after shaving. An after-shave lotion, designed as an after-shave balm and moisturizer in one, is the ideal way to replace lost moisture and soothe the skin. And, be sure to use one made just for guys - these formulas are designed so that they are not greasy, absorb quickly and dry with a matte finish so that your face doesn't look shiny. Typically, moisturizers made for women are too greasy as men tend to have not only thicker skin but also oiler skin than women due to men's larger sebaceous glands. The best after shave lotions not only replace lost moisture and soothe, but also have ingredients that will cool and refresh the skin.